1. What kind of a person is Bobby? How does being invisible change him throughout the book? 2. Why does being invisible make Bobby feel brave enough to challenge his parents in ways that he would not have otherwise? 3. How does the whole experience change Bobby’s relationship with his parents? 4. How do the very things he finds annoying about his parents help him? What do you think would have happened if he had different parents? 5. Did you find the story plausible? How does Clement’s use of real science help make the story work? 6. Why does Bobby brave coming in and talking to Alicia? 7. Why does Bobby decide to tell Alicia his secret? 8. Why do Bobby and Alicia become friends? Would they have in different circumstances? How are they alike? 9. Think about a place you go often. How would being invisible change your experience of being there? 10. At one point in the book, Bobby says “When I woke up this morning I got scared…because I woke up knowing that I’m like this. That means I’m getting used to it.” (p. 112.) Why does this scare him? 11. When Bobby tells his parents that he has told Alicia and ultimately her parents, his mother is mad, but his father accepts it as Bobby’s decision and welcomes the help. Why? 12. If Bobby had not had EVERYONE involved helping him, would he have figured out how to become visible again? 13. Why do you think Alicia chose to read The Invisible Man? She says that it isn’t depressing because Bobby isn’t like the main character. Do you agree? 14. Was meeting Bobby good for Alicia? Why or why not? 15. Why does Sheila choose to stay invisible? Can you imagine doing that? Do you think she will change her mind once she gets the box from Bobby? 16. After Bobby makes himself visible again, he says “[N]ow that I know how it’s done, would I do it again someday, on purpose? So I could take a vacation from life?” [p. 239] Would he? Would you? 17. Why are things awkward between Bobby and Alicia once he becomes visible again? 18. After Bobby becomes visible again, Alicia feels his face to see what he “looks like.” Why didn’t she want to do this before, while he was invisible? Why does it only matter now? 19. Why is Alicia afraid things will change now that Bobby is visible again? Is she right? If they do change, how do you think they will change? Clements, Andrew. 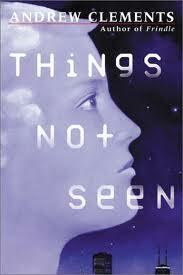 Things Not Seen. New York: Puffin Books, 2002. Questions written by Amy Lilien-Harper, Ferguson Library, Stamford, CT.